In high school, I was the co-editor of my newsmagazine. I know. Nerd. I remember back to grade school writing often in a comedic and sarcastic style that sometimes evoked a laugh or disapproving grade from my teachers. In other words, I've been writing, offending or entertaining for a long time. Being competitive by nature in running, I also want my blog to have some level of success. While I enjoy writing in and of itself, the whole idea for me is that hopefully someone else gets some enjoyment or information about running from my blog. I have had some success in building my readership which has lead to some great opportunities such as interviewing Josh Cox one-on-one at the 2013 Boston Marathon sponsored by Poland Springs and finally getting follows from the likes of Asics on twitter. (They have 53k followers and only follow back 731. I know...it doesn't take much to get me excited.) I have not ventured out into the wide range of ambassador programs because I either don't have the time, haven't been approached by the right products, or they don't find the humor in my North Korea Marathon parody post. 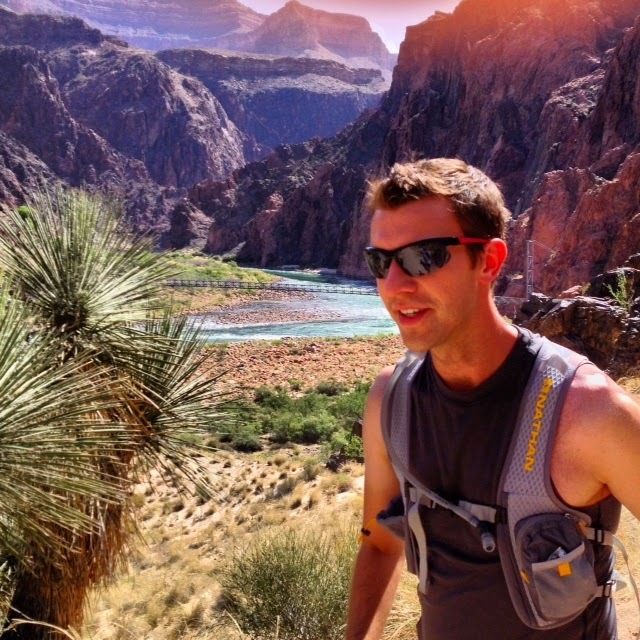 What I've told my kids is that you can never claim to know everything or stop learning so I reached out to a number of my favorite online runners to get their input on what works, and what doesn't when building your brand. Some focus on driving traffic to their blog while others have built a huge fan base on Facebook. 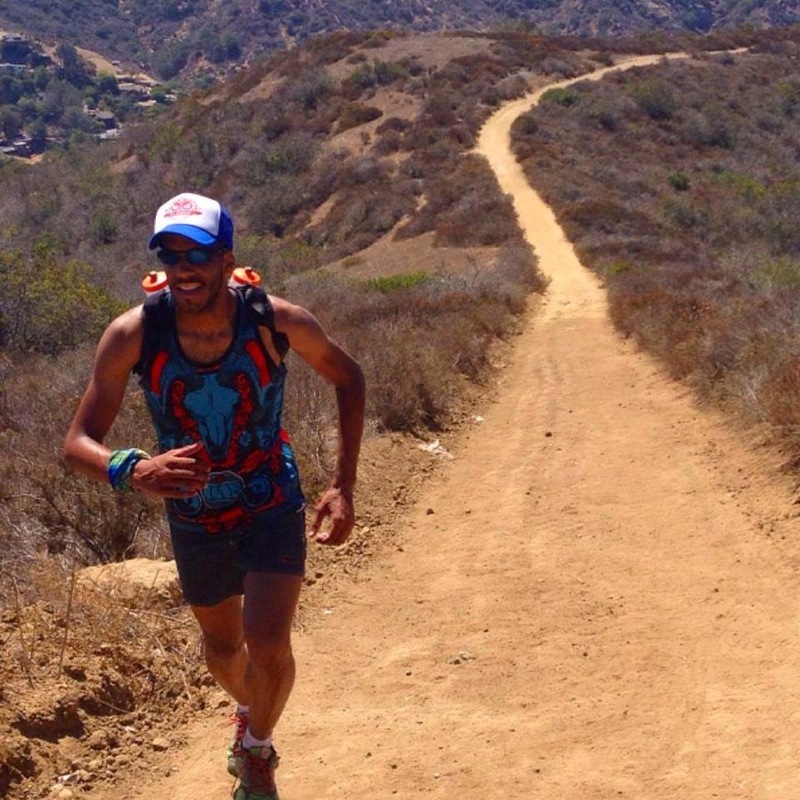 Whether you're a blogger or not, these are some great runners to follow. Their story and advice below, but first I'd be remiss if I didn't list my other social links where you can find me. You'll notice no one gave me their Google+ account as we're all still probably trying to figure that one out. "Nobody has been more shocked than me at how quickly my Facebook page took off. I started it on a whim, and as I got rolling and saw how much fun it could be, I was hooked. And that, I think, is the key - I truly find it fun. For a while last year, I was getting frustrated with not showing up in people's newsfeeds as frequently, and not having enough blog views to get sponsored or be an ambassador for products, and trying to figure out ways to 'outsmart' the system so that I'd get as many views and likes as possible. And frankly, it was exhausting and annoying and took all the fun out of it. So I let go of all that, and got back to why I started the page in the first place - to talk running. That's what I find resonates with people the most. Product reviews are nice, don't get me wrong - but what people want to hear about are the ups and downs, the struggles we all face, the triumphs we share - because we do share them, and that's what makes the community so great. I revel in other's success, and I commiserate when they don't succeed. It's a little running family, and I love being a part of it. It does require some work to build your page initially, if you want bigger numbers - comment on other's pages, put yourself out there and try to post every day - but it shouldn't feel like work. It should feel like chatting with your best running friends, because at the end of the day, that's what we're all doing." Talk about bizarre encounters meeting a virtual acquiantance in the real world. On the 5K race day prior to the April Boston Marathon, I literally ran into Linzie Starr in the Boston Commons during a shake-out run having recognized him from his tiny little online icon. He recently re-branded from SeeSharpRun to SharpEndurance. What works for him? "Social media is a very unique animal. The most important thing to remember is to BE YOURSELF! Authenticity goes a very long way. Your readers and followers aren't dumb, they can tell if you are aren't being "real". Be yourself. Also, if you have a point of view be sure that comes through in what you do. Try not to crowd or clutter your feed with information, photos, or content that doesn't have anything to do with your platform. Lastly, be responsive and engage people. Don't be afraid to join a Twitter chat hosted by a brand to increase your reach, or enter contests from your favorite brands on Instagram. Doing these small things will grow your online presence as well as establish you as a noteworthy resource readers will want to continue to connect with." Linzie is an ambassador for INKnBURN, Orange Mud, RunnerBox, EnergyBits, and PRO Compression. "Brands also want you to be authentic and not pushy. Love the product and usually they will pay attention to you if your point of views aligns with what they are looking for." RunGingerRun is authored by Sarah who is a proudly self-proclaimedGinger (Redhead). You can find her running the roads of Tulsa, OK with her husband. Together they have conquered everything from the 5K to 50K distances and almost everything in between. Her favorite race distance is the Half Marathon, however she is currently training for the Honolulu marathon in December. 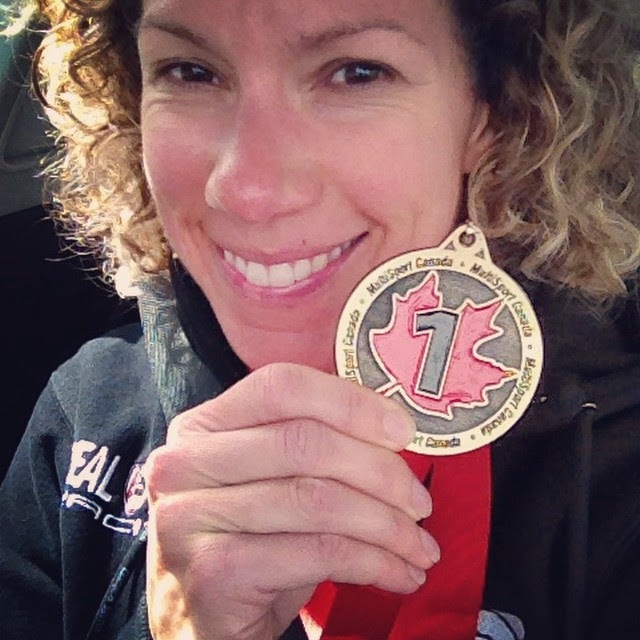 Sarah is a BibRave Ambassador, ENERGYbits Ambassador as well as a Marathon Maniac and Half Fanatic. 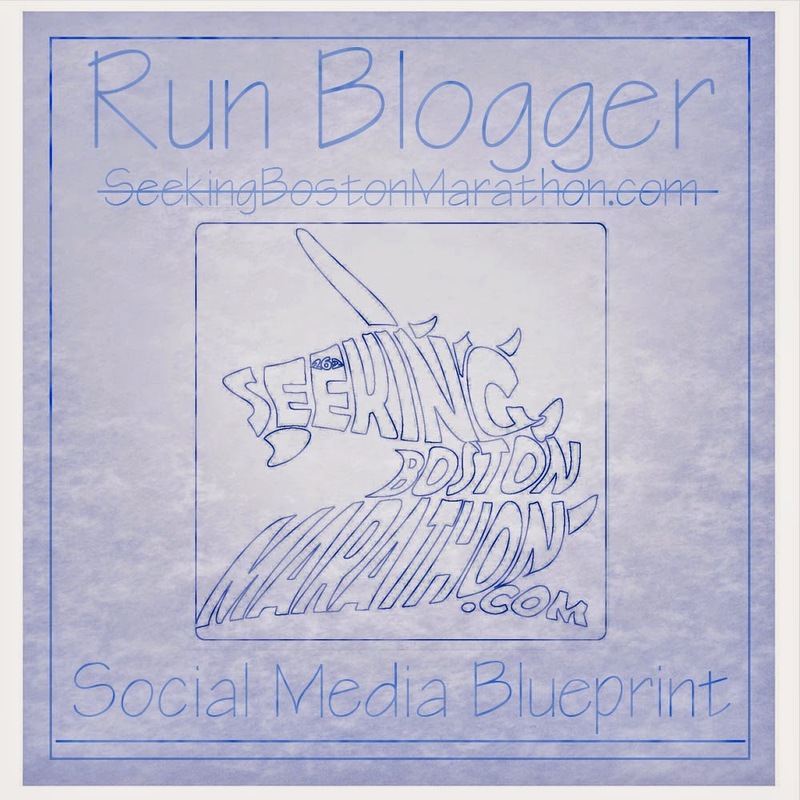 When she is not running she is either blogging or connecting with other runners on social media. Sarah's best advice for increasing readership following through social media is to be a part of the conversation! She has learned that engaging in conversation leads to better relationships and increased following more so than just hitting the follow button. She has found that Twitter has been the best avenue to increase traffic as she finds it welcomes discussion more so than other platforms from runners all over the globe. Sarah recommends participating in Twitter chats that follow along with your target interest. For example, #RunChat on Sundays and #BibChat on Tuesdays are both great ways to connect with others who love all things running. Dani is a "superstar" in the run blog world. My definition, not her's as she's modest and quite enthusiastic. 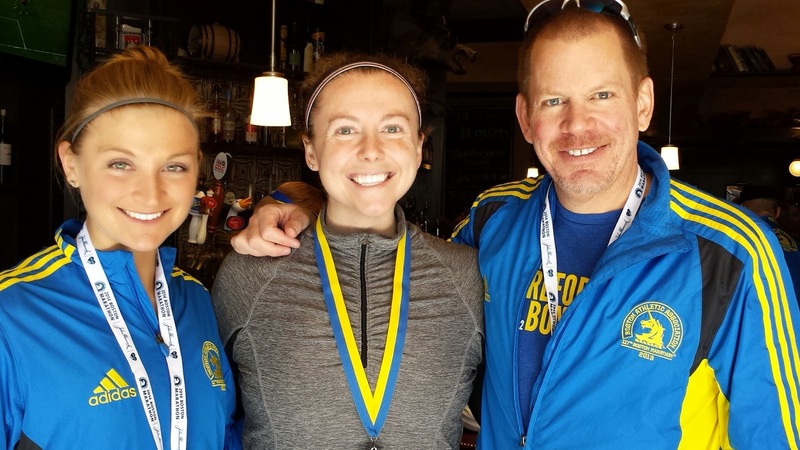 At times, she's provided advice to me, and was great to finally meet her at a blog meet-up at this year's Boston Marathon. She has strong ambassador relationships including GotChocolateMilk. Her advice to me in Boston was "don't be shy" about asking vendors for a relationship, but okay to be a bit picky--don't just promote anyone who reaches out to you. Her take on how to build a social brand. "My biggest piece of advice is to be authentic. It is the best compliment I receive on my social media channels. I share the highs and lows, the ups and downs. I am the first to admit when I slip up because there is no reason to lie to my readers. I spent so much time lying to myself which led me to be 235 lbs. If I don't lie to myself then I can't lie to my readers!! Additionally with being authentic it is the same when it comes to your online 'persona.' I am the same online as I am in person. I get so discouraged when I meet bloggers that are 100% opposites as how they appear online." Kim has been a pretty serious runner since 2005, when she finally (after several failed attempts) ran her first 5K without walking. 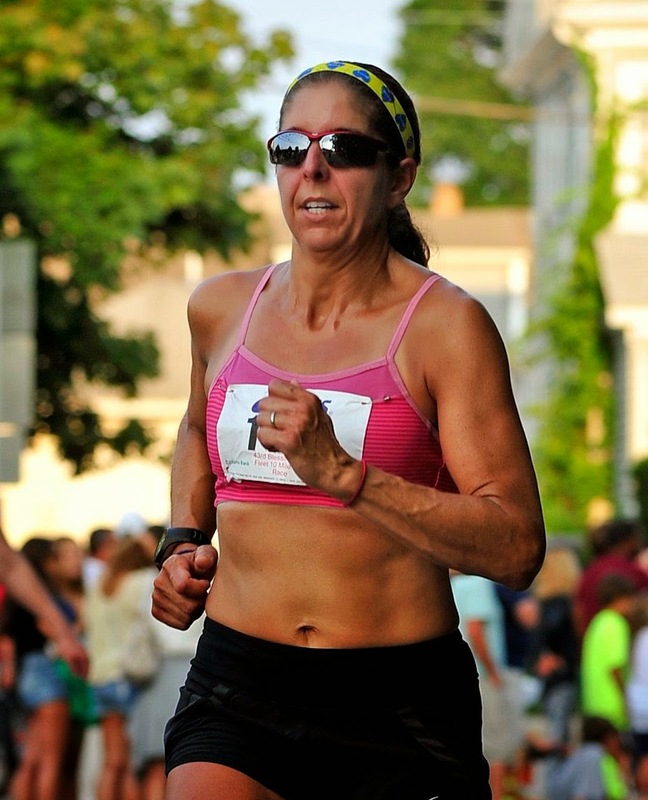 She became a very serious runner in 2008, when she ran her first 20K and was instantly hooked on the longer distance. 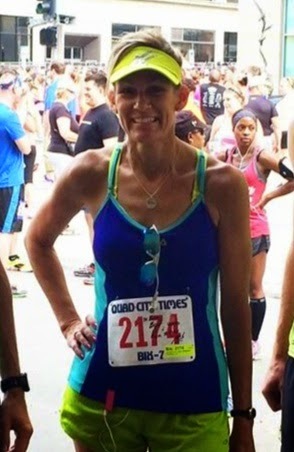 She became a crazy serious runner in 2013, when she crossed the finish line of the Quad Cities Marathon...her first 26.2. She has done more than twenty 20K's/half marathons, and is currently training for the IMT Des Moines Marathon (October 19th). "As far as social media, my preferred place to play is Facebook. I started my page, Running on the Fly, in January of 2013. I try to post something every morning, the earlier the better. Most people scroll through Facebook as soon as they wake up, so it's best to have something there waiting for them. Typically, I'll find a couple different images to post, and have at least one of these images invoke a question.....in hopes of getting my followers to reply to it (which, in turn, will hopefully get more followers to follow suit). I post a lot of pictures...motivational stuff, colorful images, and (the often dreaded) selfies. well...kind of like free advertising for all those who have shared." "Blisters and Black Toenails is home to the chronicles of Phaedra Kennedy, a self proclaimed racing junkie. She is an endurance athlete that loves to test her limits. She races everything from 5km to Ironman and is often accompanied by her husband. 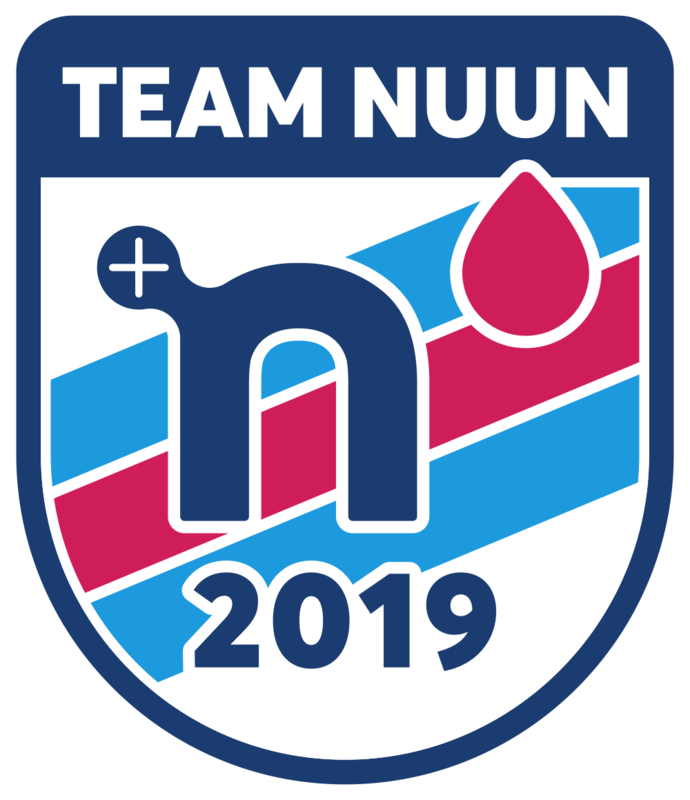 Together they can be found racing in various triathlon races throughout Ontario. Phaedra's favourite triathlon discipline is short course (750m swim, 30km bike, 7.5 km run) and her favourite run distance is the Half Marathon. She's currently coming off an action packed season that has seen her re-claim her "old broad" age group title (40-44) in her favourite triathlon race series. Phaedra races for the Real Deal Racing team and is a Sweat Pink, Mermaid Club & Fitfluential Ambassador. In order to support her racing habit, she works full time as a stills producer. When she's not working or racing, she's either instagramming, blogging or coaching. Phaedra has found that the best way to increase your readership through social media is to engage with others, whether it be by commenting on blogs, or responding to comments on her own blog, it's important to be an active participant. She's also found that linking her social media accounts to Twitter has helped increase her traffic. It's like being in multiple places at once and it provides an excellent forum for discussion." "Anyone can start a blog, but before you do, I have to ask... how dedicated are you? You have to fall in love with it in order to make it grow. You don't want it to become a chore or else it won't become what you want. No matter how great you think your posts are, no matter how awesome the content, you're going to have to spend time on social media meeting other runner/bloggers and put in the time to connect with others. The easiest way I've found to help my blog grow is visit other bloggers' pages, comment on them, and they usually will return the favor. Also, by finding a product or brand you love and applying to be an ambassador for them can really launch you forward. I'm currently an ambassador for @bibrave and @cocogo and love being involved with them! I've also grown to love what I do so much that I've created my own local running group for runner/bloggers with a social media addiction! We're #RunEatTweetAZ! Check us out and feel free to ask us any questions you might have about growing your own blog." Thanks to everyone above for the fantastic input and more importantly your online friendship. I left out a lot of runners, but please chime in on the comments section. As for me, what's worked? I think being genuine is important and I heard that a lot from the above. I tend to hang myself out there a lot...perhaps crossing over to my personal life too much, but it's cheaper than therapy. I agree that it takes a lot of time and helps to connect with a lot of runners in forums like #runchat and #bibchat. Doesn't hurt to occasionally poke the likes of Bart Yasso. He's a lot more approachable than you think and a funny and genuine guy. In media, Runner's World magazine is "king" and I've also got to know the PR folks there which has lead to great opportunities such as the #ChocolateMilkContest. I found out yesterday I came in third! Huge thanks to them and all my readers that voted for me. 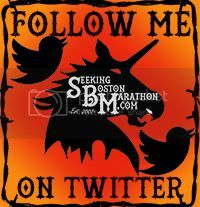 Please follow these great runners and let me know what you think. Run and read on. 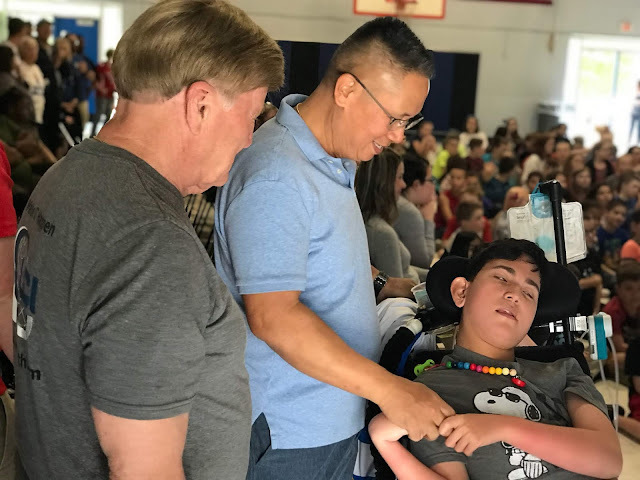 Thank you so much for including me in the great post! Lots of great advice here from other bloggers too! I love your choices! Jeremy and Linzie have become good Blends to me too. I agree with them. Be yourself. And make friends. Be nice to people. Just like life. This was such a fun post to read with a lot of good tips...thank you!! Thanks to Jeremy for sharing this post on our RunEatTweetAZ CRO page! 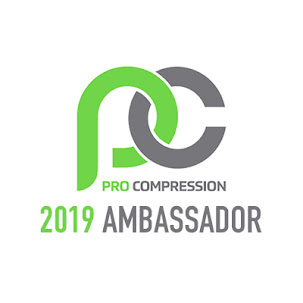 Happy to connect with all of these bloggers that are new to me! I definitely agree with the points about being yourself and being authentic!! Engaging with others is also super important as I have learned! It's so exciting to be in this blogging world! I love sharing with others and developing new relationships!